Happy Saints: Easter is not over yet! 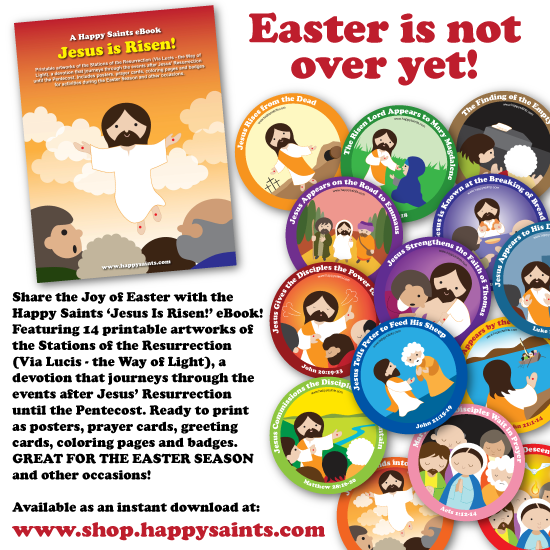 Share the Joy of Easter with the Happy Saints ‘Jesus Is Risen!’ eBook! Featuring 14 printable artworks of the Stations of the Resurrection (Via Lucis - the Way of Light), a devotion that journeys through the events after Jesus’ Resurrection until the Pentecost. Ready to print as posters, prayer cards, greeting cards, coloring pages and badges. GREAT FOR THE EASTER SEASON and other occasions!